LNG Canada’s final investment decision to build a natural gas liquefaction facility in Kitimat is a triumph of short-term politics over long-term responsibility to act on climate change. Exaggerated numbers have been used to sell the project to the public, while risks have been downplayed. The politics of liquefied natural gas (LNG) have a certain logic to them. The BC government wants to be “open for business” and be seen to support the province’s resource sectors in the north. Unlike with bitumen pipeline proposals, there is support for LNG development among many First Nations (although not all). Moreover, LNG—along with upstream fracking and processing operations in the Northeast—provides the demand for new power that will come on stream from the Site C dam in the mid-2020s when LNG Canada’s new facility is completed. Make no mistake: this project is a carbon bomb. The estimated 3.5 million tonnes per year of carbon dioxide from the plant and upstream operations are about the same as the emissions from all cars in BC or, alternatively, the emissions from all residential buildings. When it opens, LNG Canada’s liquefaction facility in Kitimat will become BC’s largest point-source emitter of greenhouse gasses (GHGs). And that’s only Phase One, with a potential Phase Two that would double output and emissions. If ever there was a wake-up call to take strong climate action, it was the forest fires that affected BC the last two summers (not to mention extreme heat and fires across the entire northern hemisphere). The federal and provincial governments’ cheerleading for LNG tells us our politicians are still asleep. LNG Canada’s facility will operate for 40 or more years, locking in substantially higher carbon emissions at a time when they need to be falling close to zero. The BC government will soon publish a new climate action plan that incorporates the LNG Canada emissions. In their modeling of BC’s carbon emissions, however, they are only planning for Phase One of the plant. But even Phase One alone will make it much harder for BC to meet its climate targets of a 40% reduction by 2030, 60% by 2040 and 80% by 2050. Efforts by other sectors of the BC economy to reduce emissions will be cancelled out by the higher emissions from LNG Canada. Prioritizing LNG over a real climate plan amounts to a form of climate change denial. 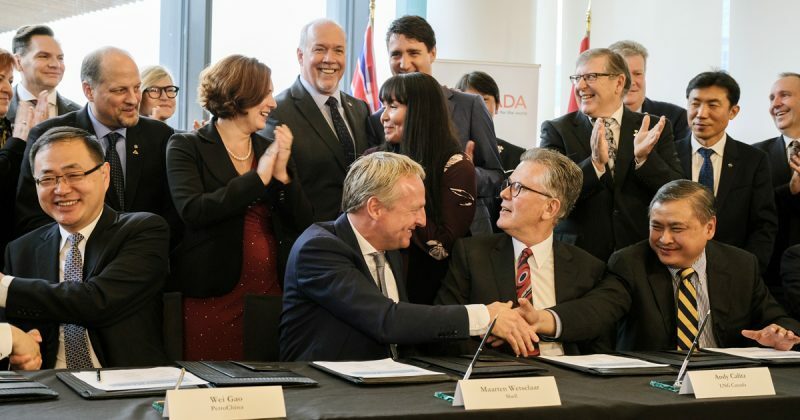 Both Prime Minister Trudeau and Premier Horgan have painted themselves as leaders on climate while approving this project. Indeed they and LNG supporters argue that we are actually doing the world a favour because BC gas exported to China could displace coal. This is dangerous wishful thinking. All in, some 46 million tonnes of carbon (CO2 equivalent) that is currently underground in the form of natural gas deposits will end up in the atmosphere every year (again, Phase One only). Most of that will be counted in the GHG inventories of the importing Asian countries, where the gas will ultimately be burned, but those emissions still matter on a global basis. The supply chain for LNG is also very energy intensive. For every unit of LNG we export, 1.44 units need to be extracted to cover the overhead of powering the processing facilities, pipelines and the liquefaction process (where natural gas is converted into liquid form). On top of that are the leaks that occur throughout the production process. Natural gas is methane, a greenhouse gas 100 times more potent than carbon dioxide. Even a small percentage (1–3%) of methane leaking along the supply chain eliminates any advantage of gas over coal. Meaning, natural gas is not a “clean” fuel—it is just as carbon-polluting as coal. Even the premise that LNG will displace the use of coal is not clear. Energy demand is growing in Asia, so new LNG imports could just add to existing emissions. In China LNG might displace some coal, but on the margin LNG could also displace nuclear or renewables. In other importing countries like Japan and Korea, LNG is almost guaranteed to increase total GHG emissions. In addition to global climate concerns are local environmental impacts or damages from the massive amount of fracking and water use that will be required to supply that gas. Such concerns have been ignored in the rush to applaud LNG Canada’s final investment decision. Meanwhile, exaggerated numbers keep being trotted out in favour of LNG. They are not quite the whoppers told by the previous government (100,000 jobs! Debt-free BC! ), but the economic benefits of the project are still being grossly overstated. The LNG Canada project’s headline number of a $40 billion investment is cherry picking the highest estimate of construction costs. LNG Canada’s Environmental Assessment application shows low and high estimates of $25 billion and $40 billion—but that is for both phases of the project, not just the Phase 1 Final Investment Decision made this week by the consortium. Moreover, the BC government’s Environmental Assessment report shows a range for Phase 1 more like $13–$21 billion, about half the headline number. Of the Phase 1 costs, only 20% of that investment will be in BC, with a range of $2.5–$4.1 billion in construction spending. That is not insignificant, but it is substantially smaller than we’ve been led to believe. Other parts of Canada actually get somewhat more of the total investment (27%), while foreign sources get more than half of the total investment. Those foreign investments include the production of modules for the plant, up to ten stories high, that will be built in China then shipped to BC for final assembly. The federal government recently signed off on tariff exemptions for those imported modules, essentially a $1 billion subsidy. Indeed, there are subsidies aplenty for a project led by Shell, one of the richest corporations in the world. BC is waiving provincial sales tax on construction, giving exemptions from additional carbon tax increases, and providing BC Hydro power at half the cost of new (Site C) generation, with the difference being paid for by other ratepayers. These subsidies are reportedly worth about $6 billion. And those are just the subsidies for the LNG Canada plant in Kitimat. Fracking is already highly subsidized in BC, resulting in the Province getting a pittance back in the form of royalties for the development of gas, a publicly owned resource. But what about jobs? The government claims the project will create 10,000 temporary construction jobs and 950 permanent jobs once completed. However, LNG Canada’s own estimate of jobs from construction is more like 3,400 full-time jobs per year on average for five years. But of these, LNG Canada estimates that only 30% of those jobs will be from BC—so knock those job estimates down to just over 1,000 jobs per year for British Columbians. Once completed, LNG Canada claims about 350–450 permanent jobs will exist to operate the facility. For a northern community like Kitimat these are obviously important jobs. There will be additional job creation upstream from increased fracking and processing activities, as well, although about half of the gas to the plant will actually come from Alberta, not BC. Some context here: there are 2.4 million people employed in BC. The LNG Canada jobs numbers are little more than a rounding error in the official statistics. As for public revenues, the government claims the project will generate $23 billion in future revenues, but this is spread over 40 years. Averaging $575 million per year, this is equivalent to just over 1% of the $50 billion BC Budget. Claims about supporting new schools and hospitals are just hot air. There’s also good reason to be skeptical about these numbers in general. It is an expensive process to produce LNG and transport it to Asia, and when all is said and done there may be little by way of profits to tax. Whether due to low gas prices, cost over-runs, or fancy transfer pricing activities, declared income for tax purposes in BC could end up being a lot less. Consider what happened in Australia, which beat BC in the race to get new LNG plants up and running. Domestic gas prices surged once the export facilities opened last year, prompting a full-blown political crisis for the government. Public revenues have been missing in action due to cost overruns and low prices, and the LNG plants were losing money. Greenhouse gas emissions jumped. And towns had to deal with wrenching effects of a short-term construction boom that pushed up housing prices, as a tsunami of construction workers moved in then left once the work was done. Don’t believe the hype on LNG. Exaggerated numbers don’t make up for the BC government’s failure to take climate change seriously.